This Highland model glass is perfect for highballs! With it's large 16 oz. size it can easily hold a double on the rocks and a beautiful garnish. 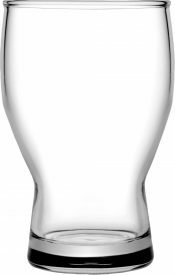 Packaged 36 per case, each glass can be deep etched, engraved or decaled with your company's custom brand logo. Don't have a logo? Deja Brew can help with that, too- call now to speak to a design pro today.